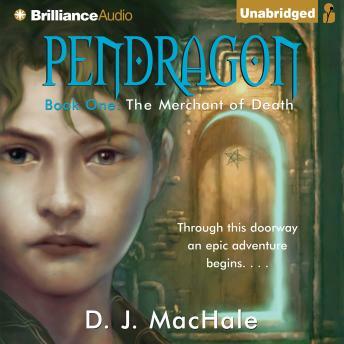 Bobby Pendragon is a seemingly normal fourteen-year-old boy. But there is something very special about Bobby. He is going to save the world. And not just Earth as we know it. Bobby is swept off to an alternate dimension known as Denduron, a territory ruled by a magical tyrant, and plagued by dangerous revolution. If Bobby wants to see his family again, he's going to have to accept his role as savior. Because, as he is about to discover, Denduron is only the beginning. . . . I read this book back in middle school and never finished the series. Hearing the audio brings me back to reliving the scenes when I first read it. Can't wait to hear the rest of the series! This is an INCREDIBLE series for ALL ages!! I say that because I'm 55 and my son is 15 and we find ourselves sitting in the garage listening (after returning from errands) because we are so into the stories! I think the characters are amazing, especially Bobby. He seems so REAL because he's not afraid to admit his fears and shortcomings. We have listened to the complete series (over a two year period) and at some point will probably listen again - it's that good. I have listened to the whole series by the time I write this review. This was a great start to a fantastic series. WOW and I thought Harry Potter was good. This book had me speachless and in awe. The story is well detailed to give you a complete picture of the mind to know whats going on. And to remember as a kid all the troubles we had. This is one, no, the best book as far as fiction, I have listen to. I't captiavted me from the first page and kept me sitting on the edge of my seat. Great Job. Thank you. This is a pretty good read, or should I say listen! At first the "teen slang" was a little annoying, especially since I don't know anyone who speaks like the main character, Bobby. I almost to stopped listening but I decided to wait until the end of disc one and believe me it gets much better. The "slang" gets less annoying and doesn't overwhelm you later in the story. This book is quite imaginative and funny, and Bobby (the main character) is entertaining and funny. All the characters in this book were well formed, no boring stock one-dimensial characters at all. Lots of twists and turns and a kind of unexpected ending. Book 2 is already on my listening list and I'm actually considering buying the book (the one made of trees), a privilege only given to only a few (Rowling, Coifer, Stroud, Pullman). You won't be disappointed!